Just how much heat do machines produce? To cool down a 75-horsepower air compressor, 15 tons or air conditioning must be in circulation (not taking outdoor temperatures into consideration). Because of this, industrial plants typically isolate heavy equipment in a room or outdoors, to reduce the spread of heat to nearby machines or workers. However, due to limited space, it’s virtually impossible to isolate every heat-generating unit in the facility. Furthermore, during summer seasons, machines can easily overheat from persistent exposure to sunlight. Because of this, operators must deploy portable cooling systems that are both cost-effective enough to run for long periods of time and powerful enough to curtail the production of high heat. The effectiveness of your cooling system highly depends on the temperature of the air being supplied to the unit. If the air is extremely hot, circulating that air won’t do much for your high-heat machines. This concept suggests that dry air fans are suitable for locations with outdoor temperatures that not extremely hot. In such areas, dry air or standard fans can be used to bring cool, outdoor air into the facility. Moreover, large industrial fans are ideal for sites that must remain dry, such as flour processing plants or dusty woodworking sites. Using a dry mist fan in such locations could cause the air to become sticky and humid, as moisture bonds with the aerial compounds. Another thing to consider: humidity and condensation can streamline corrosion. If your equipment is prone to corrosion or lack protection from corrosive agents, standard fans that push out dry air could be more suitable for your facility. Evaporative cooling systems work by bringing hot air into the unit and cooling it inside a chamber before releasing cooled, humid air back into the environment. The technology has been around for decades, way before HVAC systems hit mainstream markets. Evaporative cooling systems are capable of cooling the air down considerably, by an average of 20 degrees. They are useful for locations that experience crippling summer weather. Since bringing hot, outdoor air into the building would be counterproductive, these units can still function properly without a relying on cool, outdoor air. Dry mist cooling systems may also be used in buildings with poor ventilation or closed designs. For versatile deployment, both units offer portability around the workplace. 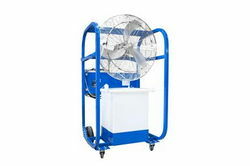 Industrial fans on carts can be wheeled around effortlessly with minimal assembly (in most cases, all you’re required to do is plug the unit in and you’re good to go). Compared to HVAC systems, the cooling units are not as expensive to purchase, install, use and maintain. They also offer more control during usage. With HVAC systems, a hot section of the facility could throw off the entire cooling system, forcing it to work harder – even though part of the building is already cool. To get the most out of your cooling system, it is recommended to observe basic guidelines surrounding the use of the units. The first thing to consider is placement and installation. Unlike HVAC systems that can be deployed in closed facilities or rooms, fans work best when there’s a small opening – such as a door or window. This allows the unit to use the fresh, incoming air and distribute it around the building. Next, the fan should be pointed at the target, not the other way around. If you put your hand on the back of a fan or dry mist system, you’ll notice that there’s a slight suction that draws air into the back, as it pushes air out from the front. The more air enters the back; the more air comes out the front. To maximize this, avoid blocking the back of the fan or evaporative cooling system. If possible, allow outdoor air to come in contact with the back of the unit.